The Intense Series 2400 are high peak power, eye safe, 1550 nm pulsed diode lasers designed for applications that require powers up to 33 mW/μm of junction length at 200 ns Pulse Width. These broad area emitters have excellent reliability and good quantum efficiency. 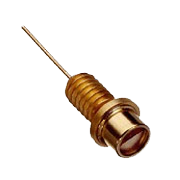 Single emitters from 150 μm to 350 μm junction length are standard. Other wavelengths from 635 nm to 1100 nm, along with stacked arrays, are available on special order. The 1550 nm laser may be overdriven at narrower pulse widths using Pod = Po * (200/Pwd) 1/2. Standard packages include 5.6MM, 9MM, TO18 coaxial, and TO5 twin lead. Options include fiber pigtails. R0 detectors are available in some packages for range finding applications. Applications for these diode lasers include hand held rangefinders, laser speed detectors, ceilometers, weapons simulation, and proximity fuses. Have A Question About Intense Products? Let Us Know How We Can Help.